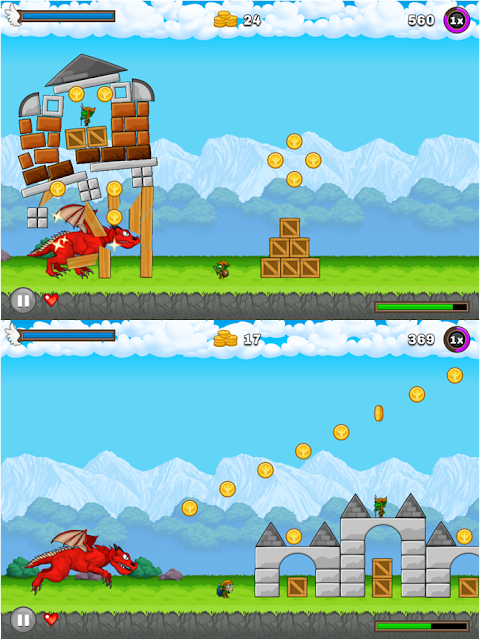 Are you tired of the same old endless running game with repetitive scenes and items? Our developers from Cycleplay came up with this reptilian-running game that is packed with loads of features and a good premise. Check out what they’ve got after the break! The game starts with a goblin disturbing the sleep of a fiery red dragon. And as expected of the perked-up beast, it’ll charge its way to seek goblins alongside the mass destruction that will plague the surrounding area. The gameplay is just pretty simple – run as far as you can and destroy everything that comes in your way. This game is such a stress reliever isn’t it? And when I say “destroy everything”, I mean wreck havoc in everything that comes in your way. However, you should avoid goblin-made bombs for you self preservation. One important gesture is the solitary holding on the screen (tap and hold), this will give you the ability to fly. This allows your dragon to increase altitude and loses weight. 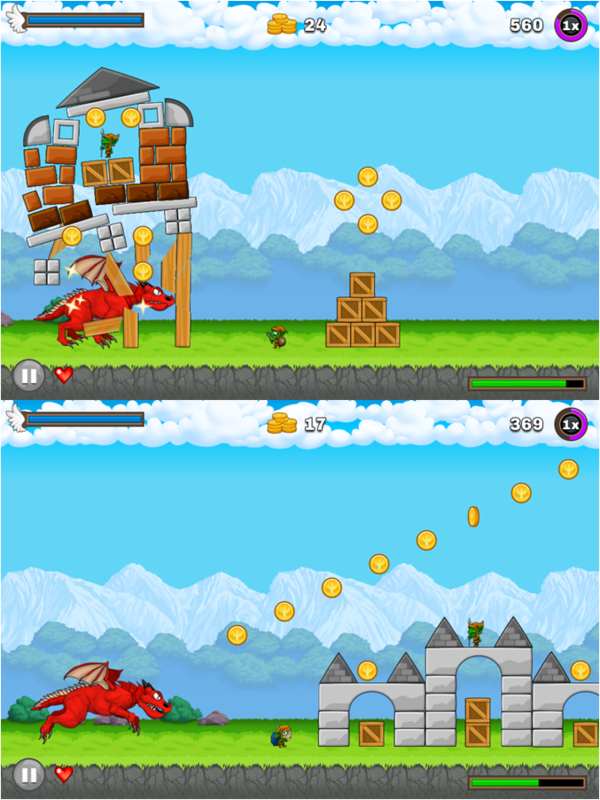 On default, your dragon will only run and devour everything on its way, even bombs. Graphics is somewhat “capable” in delivering a worthwhile experience. Plus, the soundtrack is engaging to every gamer. In terms of screen display, a “mana” bar will be seen on top left. 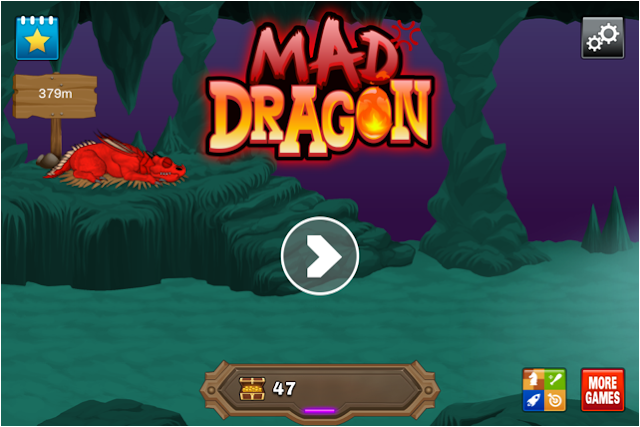 You could use this in flying attempts; once emptied, your dragon will go back to running to replenish this “mana” bar. Like any other endless-running games, you’ll have the ability to gather coins once you get in contact with them. Boosters like coin magnet and rocket launcher (which shoots you dragon forward in high speed) are good way to enjoy the game even more. Above anything else, you can’t be a Mad Dragon if you can’t breathe fire. Game is very addictive. The endless-running format with destructive abilities says it all. A first timer could easily move around the game. All you have to do is run, destroy buildings, get coins and stay alive. Coins are used to buy boosts and dragon costumes. There’s also an in-app purchases that you would love to buy like 7000 coins for 0.99 USD. Mad Dragon is simple fun! It’s a great companion on your boring walks and bus rides. One thing’s for sure, not all mad dragons are fearsome, others signal fun sessions and ice breakers.